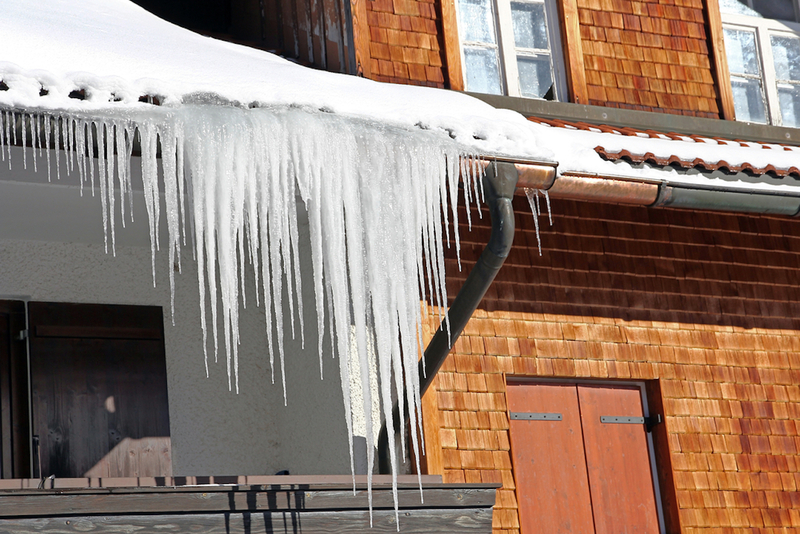 During snowy winters, ice dams can be a problem for homeowners in northern Wisconsin. It’s tempting to climb a ladder and knock the ice off, but there’s always the risk of causing additional, expensive damage to your roof in the middle of winter. It’s best to call in the experts at KV Tech Construction to remove the ice safely and to help diagnose the cause of ice buildup. Ice dams form on roofs when snow builds up on the roof, then melts and refreezes, causing a thick layer of ice to build up on roof edges, in valleys or other roof areas. This is often due to a lack of proper insulation and air sealing. Once these ice dams form, they prevent melting snow from draining off the roof and the water backs up like a lake behind a dam. Your home’s roof shingles are secured at the top of each shingle, and their overlap allows water to drain down the roof. When ice dams form, the water is pushed back up under the shingle edge and flows into the house. This uncontrolled water can cause quite a bit of damage! How are Ice Dams Removed? Like many things in life, there are many ways to do something, but only one right way. Unfortunately, many homeowners in the Bayfield, WI area attempt ice dam removal on their own. But physically breaking up thicks layers of ice with a wood maul or ax can cause even more damage to the roof system by removing or breaking shingles, and in some cases, punching a hole in the roof! Some contractors will use a pressure washer to blast the ice away, but that often compromises the shingles by literally peeling the surface off. We’ve found that the best way to attack is by steaming the ice away. 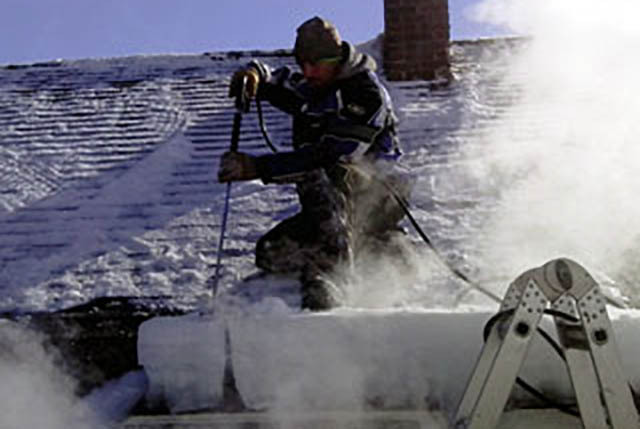 Our team uses steam to safely remove ice dams This method uses constant heat to soften and melt stubborn ice dams. Once the ice dams are removed, we can address the root causes and develop a plan to solve your ice dam problem. We guarantee damage-free ice dam removal! When your home’s attic and roof insulation is old, inadequate or missing, the heat from your home escapes to the underside of your roof. When snow falls, this escaping heat will cause melting and refreezing that builds up ice in vulnerable areas. If ice dams are a recurring problem, our certified home performance team can perform an energy audit to identify where added insulation and air sealing are needed to prevent ice dams and create energy savings. 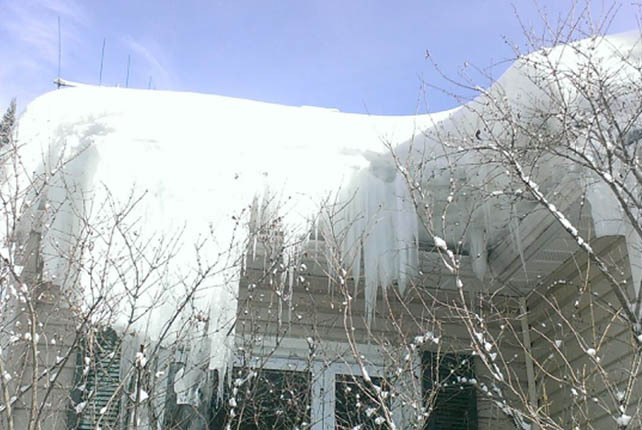 Winter ice dams can cause lots of damage. 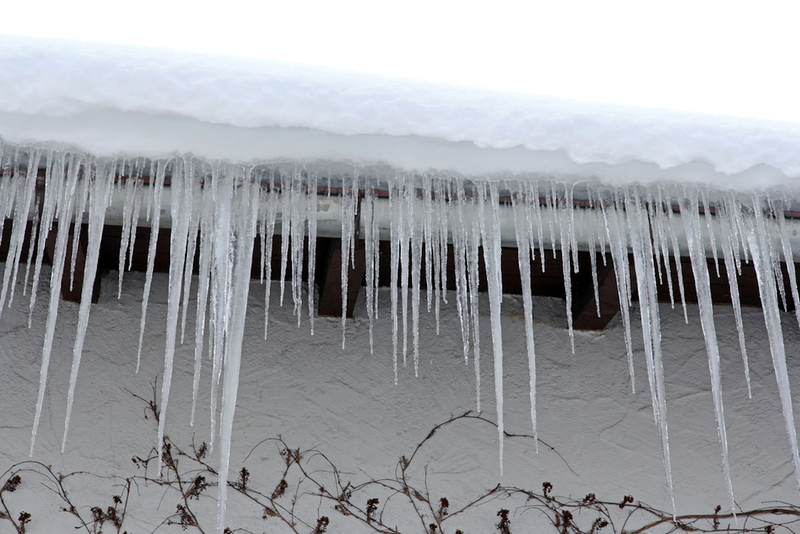 Contact us or call (715) 765-4483 to safely remove ice dams! Ice dams on your roof?